In my post, 10 books to Read before you see the movie, I told you that Killing Them Softly was coming out in October. They've just changed the date to November 20th. 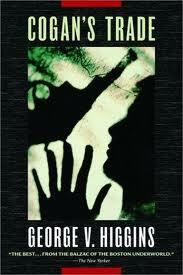 The Brad Pitt movie is based on Cogans Trade, the crime novel written by crime writer extraordinaire, George V. Higgins. A hard-hitting, tour-de force tale of the mob and the man who makes sure their rules are the only rules, by the American master of crime George V. Higgins. Jackie Cogan,(played by Pitt) is an enforcer for the New England mob. When a high-stakes card game is heisted by unknown hoodlums, Cogan is called in to “handle” the problem. Moving expertly and ruthlessly among a variety of criminal hacks, hangers-on, and bigger-time crooks—a classic cast of misfits animated by Higgins’s hilarious, cracklingly authentic dialogue—Cogan gets to the root of the problem and, with five consecutive shots from a Smith & Wesson thirty-eight Police Special, restores order to his corner of the Boston underworld. Combining his remarkable wit and a singular ability to show criminal life as it is lived, George V. Higgins builds an incredible story of crime to an unforgettable climax. I'm a violence and crime wimp. Even though Brad Pitt can pull off nearly any role, I'll probably pass on this one. Libby that sounds like the Trifecta 33 word version of what must have been an emotional journey. WOW! I have so many questions - are you and your son raising the child? Is your son back at boarding school? What about the girl's family? Of course these are none of my business. My sister is raising her alchoholic daughter's son; the last thing she expected to be doing in her 50's BUT she adores him. I hope all goes well with your son and the new addition to your family. You will just have to write during nap time. Yep...we are raising him. Ok, well mostly I am raising him. My son is going to school locally now. I am so massively in love with the baby that it is ridiculous. LOL! I have hardly put him down in over a month. I love it when people think that he is my baby - haha! This wasn't in my plans...but, he turned out to be a great surprise!